Seventh edition, the fourth illustrated edition, the first with metalcuts. 264 x 195 mm. – 47 leaves (a missing leaf supplied in facsimile in 1879). 34 metalcut illustrations. The Spanish cardinal Juan de Torquemada (Turrecremata; 1388-1468) was a distinguished theologian present at the councils of Constance, Basel, Ferrara and Florence, and a defender of the papal primacy. Turrecremata is thought to have summoned the German printers Sweynheim and Pannartz to Subiaco, where they introduced the art of printing to Italy around 1464. 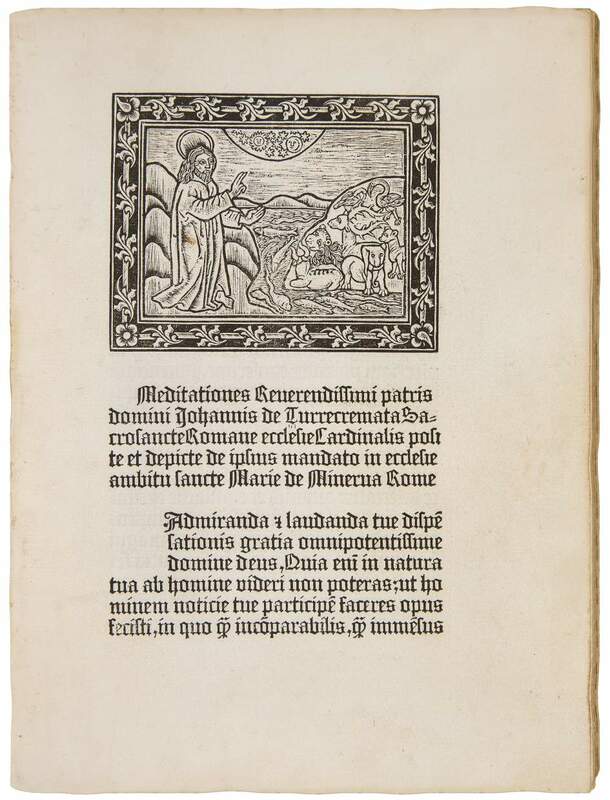 He probably also called Ulrich Han to Rome, who printed the first edition of his Meditationes on the life of Christ in 1466/67. This is regarded as the first Italian illustrated book and was the model for the present edition. The 34 metalcuts show biblical scenes mostly from the life of Christ, all but one set within the same frame of a leafy border. The introduction of printed book illustration in Mainz came relatively late, regarding the fact that printing books was invented here in the 1450s. Moreover, the use of metalcuts in this edition instead of the common woodcut illustration seems extraordinary, as this technique is generally quite rare in German book illustration. Please contact us with any inquiries. Visitors are welcome in our premises by appointment. Our Antiquariat will be closed from the 22nd to the 26th of April 2019 for a short Easter break. To subscribe to our newsletter, contact info@guenther-rarebooks.com.